Getting What You Want | A Daily Dose of Zen Sarcasm! I took this picture, and I guess I just knew that this would be a stunning shot (if I may brag a little). 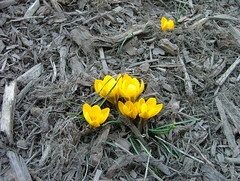 The crocuses are tiny and humble and barely visible among the mounds of mulch that still protect some of the flower beds– the mulch is gray. The crocuses are bright yellow. They sit there –such a simple life, and lived boldly and with no other agenda than perhaps making enough food to be able to propagate their little tiny bulbs underground and live another year. And for a moment, everything is perfect and makes sense. And then, a truck whizzes by, or the leafblower revvs up, or the Maryland car honks as it speeds on by. And you realize, you have gotten what you want– and yet everything is the same. 13 Mar	This entry was published on March 13, 2008 at 8:54 pm and is filed under Photoblogging. Bookmark the permalink. Follow any comments here with the RSS feed for this post. That is a really striking photo. The colors are wonderful. I’m still waiting for my own crocuses. They seem late this year. Or maybe I’m just impatient. oooh…perdy! you’re so handy with that camera. Lovely shot. Crocuses have always impressed me as the boldest and most optimistic of flowers. Lots of lessons they can teach us if we’re willing to learn.